Elizabeth Zimmermann (inventor of the term I-Cord, as well as dozens of variations) and her daughter, Meg Swansen, have utilized I-Cord in uncounted practical, innovative, and delightful ways. Here is a novel use by Meg. Originally a design in the book Handknitting with Meg Swansen and a video, the I-Cord Gloves design is now available for the first time in streaming format. Meg turns the ease of working I-Cord to the application of fingers for beautiful, form-fitting gloves and guides the viewer through each step of construction, demonstrating: Cast on, increasing, I-Cord, picking up stitches, weaving, decreasing, color-pattern knitting, and more. Gloves are a great small project - portable, fascinating, quickly finished, and eminently useful - plus, you can easily work Meg’s design of a matching hat. Click for a free download of the schematic and charts to accompany Meg’s video instruction. 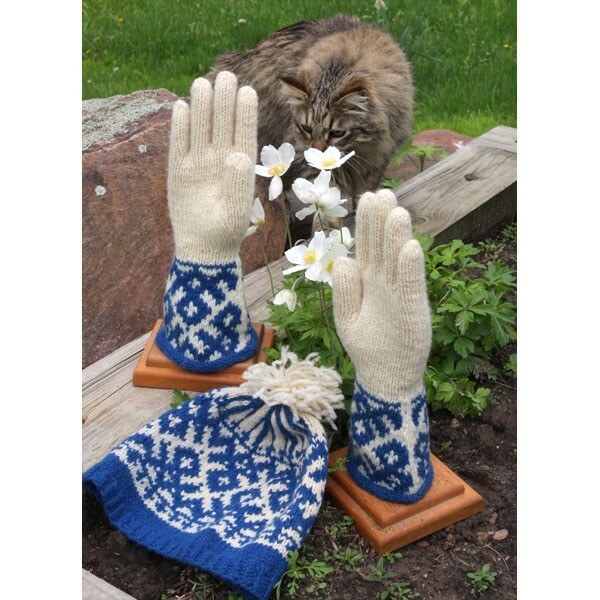 To knit the I-Cord Gloves, we recommend 2 skeins of Quebecoise wool (one main color and one coordinating color). To knit the hat, we recommend 2 skeins of Quebecoise Wool (one main color and one coordinating color). To knit both projects, we recommend 4 skeins of Quebecoise (2 main color and 2 coordinating color), though you may have wool left over depending on the length of glove gauntlet and hat width and depth.